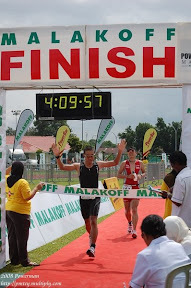 I was really looking forward to Ironman 70.3 Putrajaya. My training was going really well but now after the event was cancel and postponed to a later date - malas rasanya kan berlatih. The new date is schedule on 4th October 2009, 2 weeks after Hari Raya and that only gave me around 1 week to practice, 2 days of berhari raya and 5 days of tapering including travelling to race site. The biggest problem would be swimming - Swimming pool is closed during fasting month and will only be open probably after 3rd Hari Raya. Maybe if I'm lucky some private swimming pool such as JPMC, Mabohai, Fitness Zone or BSC will be open but since I'm fasting that only leave me night time for swimming. For other training - running and cycling, I can do it before breaking the fast and after terawih but I can only do a maximum of 10k run and maybe 15 to 20k bike ride. Not enough. After considering that I will not be having enough practice, I've decided to cancel my participation. Kalau ganya rasanya kan ikut and cross the finish line, I can do it but since I have a high expectation, that will not be enough for me. I want to cross the finish line within my target time and with style - I don't want to cross the finish line macam orang inda bernyawa, exhausted, longlai, walking like a robot and anything resembling a person participating in an event without any training and preparation - it looks ugly, humiliating and stupid - sorry to those kalau ada yang terasa. That how I felt - merasa ku udah. Just a reminder this is 1.9km swim, 90.1km bike ride and lastly 21 km run - so you will understand that you need proper training for this not like your going for a walk in the park and furthermore I've invested a lot of money for this event - (money well spent not money wasted) - so have to train. yup bro, you made a good decision here not to join the Putrajaya race ... the schedule doesn't fit well with the festive occasion. very hard to train. but hey, u have a good substitute there. r u joining the TNF100 Singapore?